From Answers in Genesis, this pocket guide is easily organized so you can quickly find the answers to the most common creationist challenges. Learn how to defend yourself against faulty arguments and equip yourself to defend your beliefs logically! 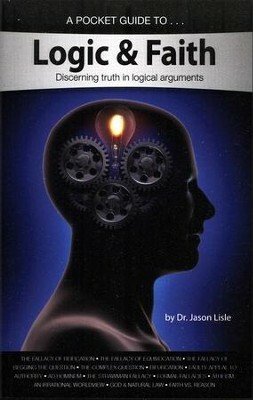 This succinct 96-page pocket guide is a unique and handy illustrated book that provides excellent summary answers on the role of logic in refuting and explaining ideas. 96 pages, softcover. Ages 12 & up. I'm the author/artist and I want to review A Pocket Guide to Logic & Faith.